This e-book is an overview of how to sell cash-secured puts to develop a low-risk, wealth-building strategy for retail investors. Put-selling is a strategy similar to, but not precisely the same as, covered call writing. 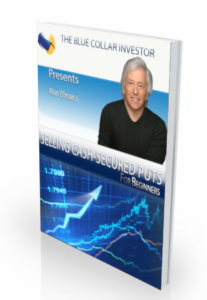 This book is meant to be a beginner’s guide to mastering this conservative strategy and help create an opportunity for retail investors to secure our financial futures. Mastering both strategies will allow us focus in on the best investment choices depending on market conditions and personal risk tolerance. Becoming financially independent is our common goal and the mission statement for Blue Collar Investors all over the world! The purpose of this book is to give the reader an overview of the tools needed to master a conservative stock and option strategy with the goals of generating monthly cash flow and focusing in on capital preservation. Selling cash-secured puts is a low-risk strategy that leverages high-quality stocks and exchange-traded funds to accomplish these objectives. For conservative investors with low risk tolerance. Generate monthly cash flow while capital preservation remain a priority. Use with covered call writing to create a multi-tiered cash-generating strategy.